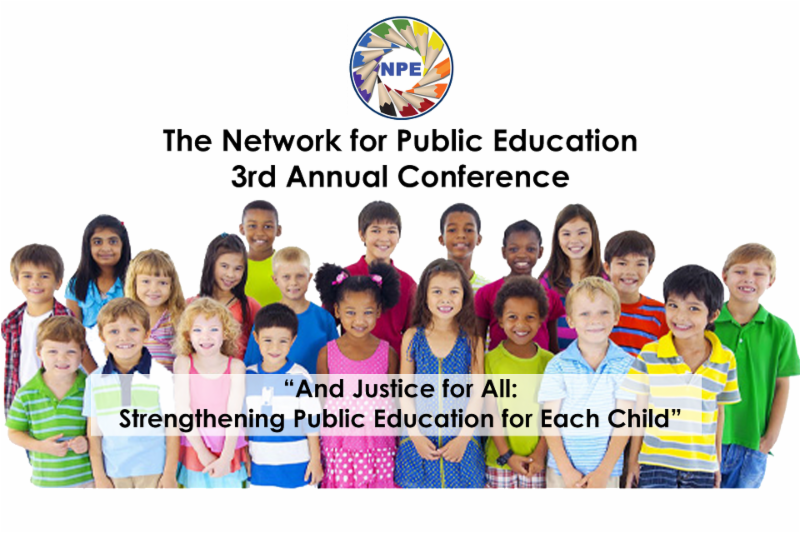 The 2016 Network for Public Education Conference, held April 15-17 in Raleigh, NC, is truly an experience—something hard to describe. For a few days in April, education and social justice activists from around the country come together in a burst of energy and synergy to share lives and ideas and to build an education movement for equity and justice for all children. 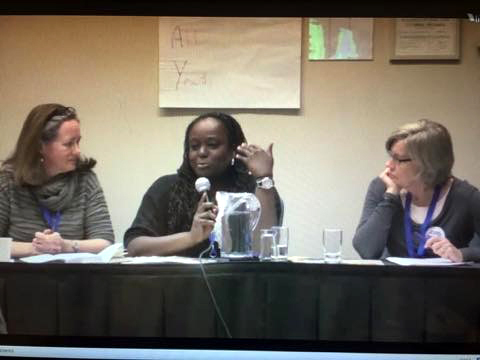 I was glad that Denisha Jones, DEY National Advisory Board member, and I attended because our session was the only one focused exclusively on young children. Our panel was called T-E-S-T and Not PLAY is a Four-Letter Word: Putting the Young Child and the Teacher at the Center of Education Reform. Susan Ochshorn, early childhood author and journal ist, moderated, and we were joined by Michelle Gunderson, first grade teacher and early childhood leader in the Chicago Teachers Union. We covered many issues in a short time including the decrease in play and active learning in classrooms for young children, the disproportionate effects of corporate education reform on black and brown children and those in low-income communities, and the need to strengthen our advocacy for young children. 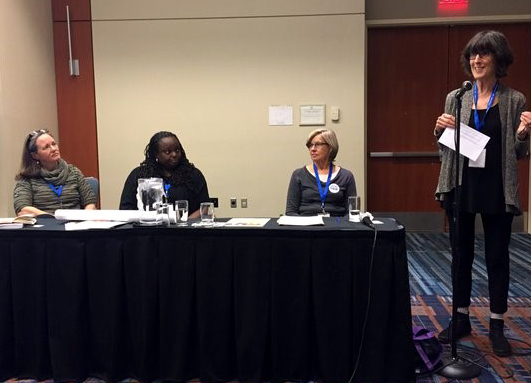 Lots of folks attended the session and I was really glad we were there to connect early childhood issues to the larger landscape of education reform that were the focus of the conference. Many people came up to me over the course of the three days in Raleigh to tell me how they follow DEY, appreciate us, and benefit from using our materials. It was really he artening to realize that we are voicing important ideas and issues that might otherwise not be accessible to teachers and parents. People are using the papers we’ve put out in a variety of ways as well as our fact sheets, and many say they read our website regularly. Do something fun together. Go see a movie or to a concert or an art exhibit. Put one foot in front of the other – take small steps and always, always celebrate your wins no matter how small they may seem. Do your research so that you are prepared. Support each other. Kindness begets more of the same. Be persistent. Do not give up. Oftentimes your opponents will respect you for your integrity and persistence even if you are always opposing them. Do not mistake attempts to subvert you for respect – a fine line to walk. Be positive. Look at what is possible. For this you need to know what you believe in. Talk with people. Collect business cards. Talk with the reporters who cover education. They may come to see you as a reliable source of information. Change the conversation. 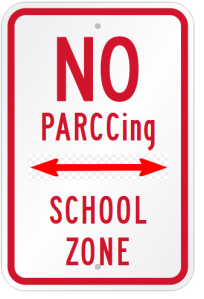 For example, instead of their talk about high performing schools, change it to, “Every school a great school.” Instead of choice always meaning a charter school, change it to choice meaning good neighborhood schools. Act like a toddler and repeat this over and over and over again. As of this morning, 39 early childhood professionals have joined us in signing the letter. Today we are mailing this updated letter to NAEYC. If you are hearing about the letter for the first time, and would like to sign, we can easily add you to the letter posted on our website. Simply send an email to geralynbywater@gmail.com and write “Open Letter” in the subject line. Let us know how you would like to be identified. And, if you are a prek-3rd grade teacher, please to take a few minutes to respond to our current survey of teachers. We want to hear from you about how demands on you have change since you began teaching – and how your teaching and assessments have changed as well. Thank you! visit. There wasn’t anyone to check out the books. expense), funding for schools is continually cut. The writer is a retired librarian in the Newton Public Schools. In response to the ever-increasing emphasis on high-stakes testing and the negative impact this is having on authentic teaching and learning, The American Federation of Teachers (AFT) has launched a new campaign, “Learning is More Than a Test Score”. This campaign combines collaborative planning opportunities, ideas for activism and a website for sharing research, testimonials and news. Since the implementation of No Child Left Behind, we’ve seen a growing fixation on high-stakes testing as a central piece of the effort to improve schools. Unfortunately, the result has been exactly the opposite. The low-level, high-stakes tests that now hang over our teachers and students—and their extreme misuse as a result of ideologically and politically driven education policy—have seriously damaged our public education system. Appropriate assessments are an integral part of a high-quality education system. But an accountability system obsessed with measuring, which punishes teachers and schools, comes at a huge cost. Vital parts of the curriculum—arts, music and physical education, to name a few—are being shortchanged or abandoned because they are not subject to testing. Teachers have been forced to spend too much time on test preparation and data collection, at the expense of more engaging instruction. As a result, our students aren’t getting the opportunities they need to learn how to think critically and creatively, which is essential to a 21st-century education. Here at DEY, we urge you to sign the petition and spread the word to colleagues, parents and community members. For email news and updates. 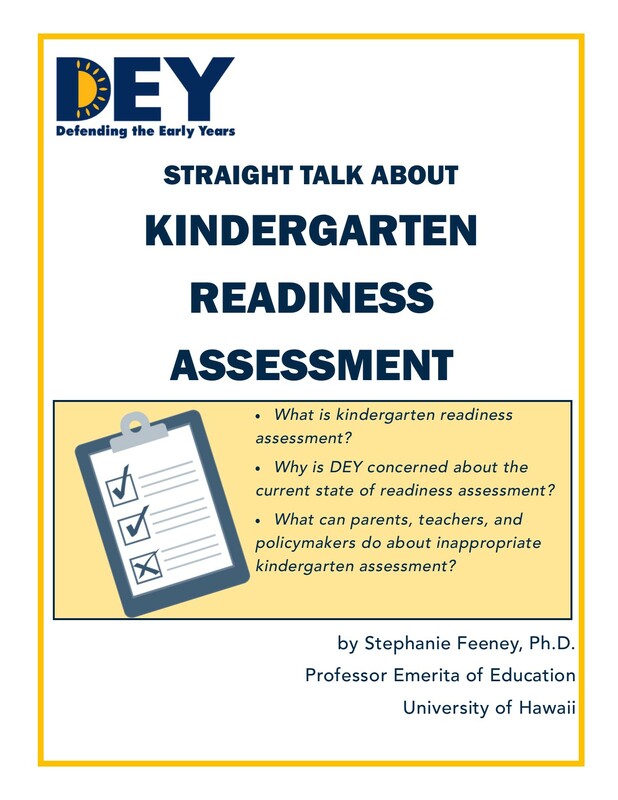 * NEW* Straight Talk About Kindergarten Readiness Assessment: Click on the image below to read and download. 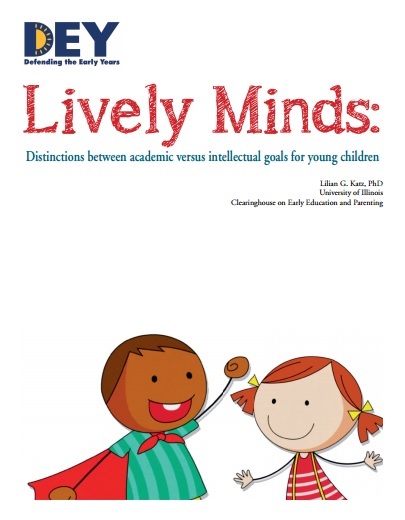 Lively Minds! Click on the image below to read and download. Reading Instruction in Kindergarten. Click on the image below to read and download. 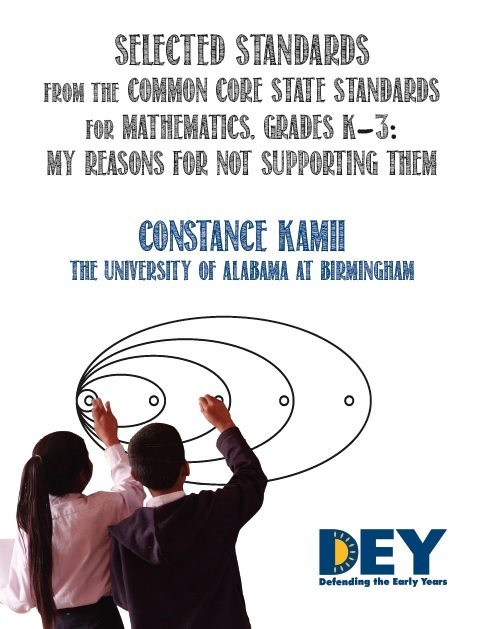 Constance Kamii’s Selected Standards from the Common Core State Standards for Mathematics, Grades K-3: My Reasons for Not Supporting Them. Click on the image below to read and download.